KODAK, Tenn. - Taylor Featherston delivered a go-ahead two-run homer against Scott Effross (L, 2-6) and the Wahoos clinched a playoff berth for the fourth season in a row with a 4-3 win Sunday night Smokies Stadium. Trailing 2-1 in the in the seventh inning, Gavin LaValley led off the inning with a single. Featherston followed and belted Effross's 2-1 pitch over the right-field fence, which put Pensacola up 4-3. The Wahoos picked up their first two runs of the game courtesy of Shed Long's two-run homer in the top of the fourth. Daniel Wright started the game for the Wahoos and allowed three runs across five innings. After scoring a run in the bottom of the fourth, the Smokies took the lead against Wright after Eddy Martinez hit a two-run homer to give the hosts a temporary 3-2 lead. The bullpen turned in four shutout innings for Jody Davis to secure the win. Nick Howard (W, 2-0) turned in a scoreless sixth inning, and after the Wahoos retook the lead, Joel Bender pitched two scoreless frames in the seventh and eighth. Alex Powers (S, 18) closed out the ninth inning in what will likely be his final appearance of the regular season with his 18th save of the year. 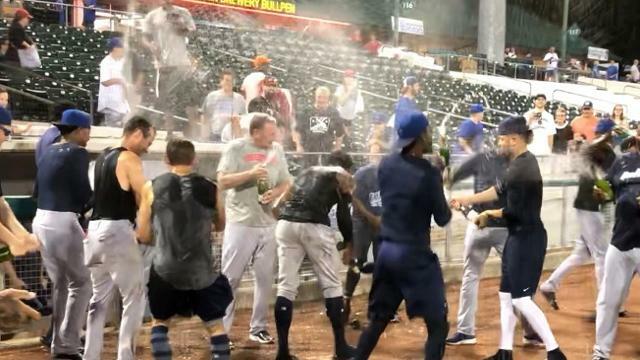 With Mobile's loss to the Biscuits earlier in the day, Pensacola mathematically clinched the final spot in the 2018 Southern League Playoffs with a chance to defend last year's Southern League Championship. The Wahoos join the Montgomery Biscuits as the second Southern League team this decade to make the playoffs four years in a row. Pensacola will begin their title defense on Wednesday, September 5 in Biloxi against the Shuckers. With Birmingham's 6-3 win over Biloxi on Sunday, the Wahoos can clinch the second-half title with a win over Tennessee and a Biloxi loss on Monday. As it currently stands the Wahoos are guaranteed a playoff spot as the wildcard, meaning that four of the five games (if needed) would be played at MGM Park. If the Shuckers hang on to win the second-half, Pensacola's only home playoff game in the first round would be on Friday, September 7 at Blue Wahoos Stadium. The 2018 regular season concludes Monday afternoon in Kodak. RHP Wyatt Strahan (7-11, 6.35) is looking to wrap up the campaign on a winning note while RHP Keegan Thompson aims to give Tennessee a consolation win to end their season. Monday's finale can be heard on 97.1 The Ticket/1490 AM Milton, and www.bluewahoos.com. First pitch is scheduled for 12:00 p.m. E.T.